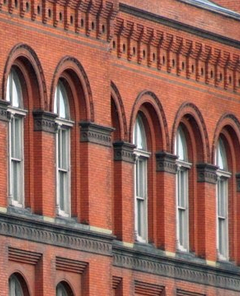 Historic buildings often evoke a strong sense of nostalgia within a community or organization, but the old windows in these buildings can be a major source of energy loss that keeps utility bills high. Replacement windows, however, are not always an option due to factors such as window cost, architectural integrity issues and the potential loss of possible historic tax credits. Installing the Thermolite Window System by Therm-o-lite Inc. is easy, allows the existing historical windows to remain and will maintain the beauty and character of your historic building. Since 1979, Thermolite has been a leading innovator in supplemental interior window systems. We are a GSA-certified contractor and work with governmental agencies, the U.S. military, commercial renovators, hospitality facilities and historic preservation projects. Our patented Thermolite Window System is a one-of-a-kind alternative to traditional replacement windows. This 100% customized window system is designed to provide superior protection against bomb blast, audio espionage and hurricanes while reducing noise, sealing the building envelope and preserving historic architectural integrity. Historic Structures is a general contractor specializing in historic preservation in Maryland, Virginia and the District of Columbia. Over the last 30 years, we have participated in the restoration of some of the best known historic residences in the US, including The White House, the Lincoln Cottage (President Lincoln's summer residence), and the Blair House (the presidential guest house). Our primary mission has been to produce elegant, integrated solutions in the widest range of historic materials. Our principal, Stephen Ortado, is a carpenter by trade, an engineer by training and a preservationist by avocation. Mr. Ortado has over several decades developed the comprehensive array of historic restoration services necessary for the sound, economical preservation of historic structures. In addition, we have nurtured valued working relationships with some of the most accomplished artisan specialists in the country. Whether or not any American presidents have ever stayed at your house, we will employ these skills to preserve your unique, historic and equally irreplaceable period home.